Achilles tendon repair reconnects the ends of the broken tendon so that you can use your foot again in a normal way. You may have had one of two types of surgery. In open surgery, the doctor makes a cut (incision) at the back of your leg. In percutaneous (say "per-kyoo-TAY-nee-us") surgery, the doctor uses several smaller cuts. Tools for fixing the tendon are inserted through the cuts. You will feel tired for several days. Your lower leg and ankle will be swollen. You may have numbness around the cut (incision) on the back of your leg. Your ankle and shin may be bruised. You can put ice on the area to reduce swelling. It should be better in a few days. Your tendon will slowly get stronger as you recover. You will need to wear a cast or walking boot for 6 to 12 weeks after surgery. 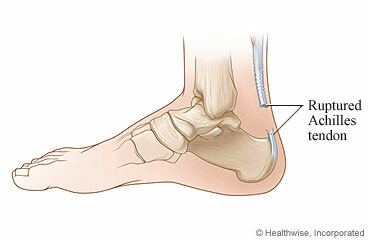 At first, it may be set to keep your foot pointed downward as the tendon heals. You may be able to put weight on your affected leg after a few weeks. But it will be several months before you have complete use of your leg and ankle. You will need to build your strength with rehabilitation (rehab) exercises. How soon you can return to sports or other exercise depends on how well you follow your rehab program and how well your tendon heals. Your doctor or physiotherapist will give you an idea of when you can return to your activities. You may be able to return to your regular sports in about 4 to 6 months. Rest when you feel tired. Getting enough sleep will help you recover. Sleep with your sore leg raised. Your doctor will tell you how to keep your leg and foot in the correct position. Keep your leg raised (such as on a pillow) as much as possible for the first few days. You will need to wear a cast or walking boot that keeps your foot and ankle from moving for 6 to 12 weeks after surgery. You can use crutches to move around the house to do daily tasks. Do not put weight on your leg without these until your doctor says it is okay. You may shower 24 to 48 hours after surgery, if your doctor okays it. When you shower, keep your bandage and incision dry by taping a sheet of plastic to cover them. It might be best to get a shower stool to sit on. If you have a brace, only take it off if your doctor says it is okay. If your doctor does not want you to shower or remove your brace, you can take a sponge bath. Do not take a bath, swim, use a hot tub, or soak your leg until your doctor says it is okay. You can drive when you can move and control your foot and ankle, you are no longer using crutches, and you are no longer taking prescription pain medicine. This usually takes 4 to 6 weeks. How soon you can return to your work depends on your job. If you sit at work, you may be able to go back in 1 to 2 weeks. But if you are on your feet at work, it may take 6 to 8 weeks. If you are very physically active in your job, it may take 3 to 6 months. You can eat your normal diet. If your stomach is upset, try bland, low-fat foods like plain rice, broiled chicken, toast, and yogurt. Drink plenty of fluids. If you have a bandage over your incision, keep the bandage clean and dry. Follow your doctor's instructions. Your doctor will probably want you to leave the bandage on until you are seen in the office. If your doctor allows it, you may be able to remove the bandage 48 to 72 hours after your surgery. If you have strips of tape on the incision, leave the tape on for a week or until it falls off. Keep the area clean and dry. If you have a splint or cast, follow your doctor's instructions. Keep it dry. Do not put anything, including powder, between the splint or cast and your skin. Exercise in a rehab program is an important part of your treatment. Your first exercises will help you regain flexibility. They may also keep scar tissue from forming around the tendon. To reduce swelling and pain, put ice or a cold pack on your leg for 10 to 20 minutes at a time. Do this every few hours. Put a thin cloth between the ice and your skin. Prop up the sore leg on a pillow when you ice it or anytime you sit or lie down for 3 days after surgery. Try to keep it above the level of your heart. This will help reduce swelling. If your doctor gave you support stockings, wear them as long as instructed. These help to prevent blood clots. Enter S501 in the search box to learn more about "Achilles Tendon Repair: What to Expect at Home".